This month in E.L.A we have finished book clubs and have just started reading the book “Red Wolf.” The book is about a young aboriginal boy that has been forced away from his family by the Canadian government to attend a residential school. So far both of our classes are enjoying the book. In Science class we have been learning about the particle theory and the difference between temperature and heat. Everyone was put in a small group and we had to make an insulator that would fit in our backpack. We had to put a can full of water inside the insulator with a thermometer that we checked periodically over the course of an hour. Several students have been attending the Inner City Science Center once every two weeks. In Social Studies we have been learning about human rights. We have to do a research project on either a human rights activist or on an event where we can show what human right was violated. In Math we have started learning about integers. The grade 7’s are learning how to add and subtract integers while the grade 8’s are learning how to multiply and divide integers. In shops, the grade 7’s are in electronics and have been building shocking devices. The grade 8’s are in Freeze Frame and have been working on creating their own music videos. 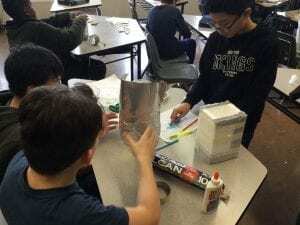 All junior high students have just switched creativity hour classes. Half of the students are now in dance, while the other half is in technology on Days 1 and 2. On Days 3 &4, half of the students are in music while the other half is now in Spanish. 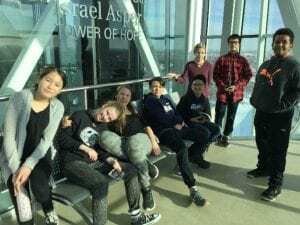 On Janary 16th, eight junior students attended the divisional “Everyone Has the Right Conference” at the Human Rights Museum. 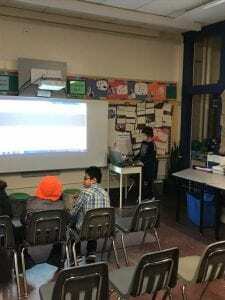 On Thursday, Feb. 14th, the principal from the MET School in Seven Oaks School Division and 4 of her students, attending our Genius Hour afternoon and shared with us their projects and to talk with us about how their project based learning presentations are done. On Feb.27, ten junior students will be attending the Youth Matters Conference hosted by the Winnipeg Police Service. All junior high students will be taking part in the Speak Up, a mental health literacy program that will take place every morning next week. Finally, many of us are looking forward to the junior high ski trip on March 7th. The Earl Grey Choirs will be singing in the Winnipeg Music Festival this year! You are welcome to come watch your child’s performance in the festival. Admission to watch costs $5 (children are free). The Grade 6-8 “Advanced Choir” Club will perform on Tuesday, February 26th at 12:30 p.m. at Westminster United Church. The Grade 1-3 Choir (Rooms 12, 16, 21, 22, 23) will perform on Monday, March 4th at 10:00 a.m. at Westminster United Church. The Grade 4-6 Choir (Rooms 25, 26, 27, 28) will perform on Tuesday, March 5th at 10:00 a.m. at Westminster United Church. We enjoyed another visit from WISE-Kid Netic Energy this month! Students investigated a variety of exciting chemical reactions that extended our learning about matter. We were amazed by the changes we observed after mixing substances together including changes in temperature and colour. At the end of our session each student created a bouncy ball. 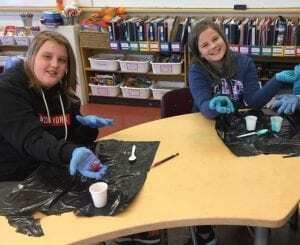 When mixing substances together, it was a challenge to create the appropriate consistency needed to form the bouncy ball. At the end, it was all worth it! Experimenting with matter is truly amazing! This month we have been learning all about animals that live in the arctic. 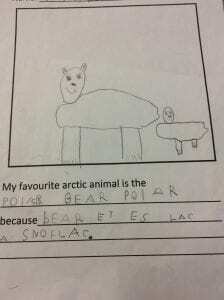 We have also been practicing reading and writing about arctic animals. 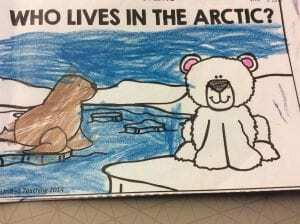 We can all read the book “Who Lives in the Arctic?” As a class, we made a video about which animals are our favourite for the January assembly. The Spanish Team would like to let you know that there will be an upcoming Information Evening for the Spanish program on February 21st at 6:30 pm until 7:30 pm. 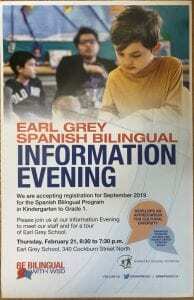 This will be a great opportunity for individuals who are interested in having a student in the Spanish bilingual program at Earl Grey. We are now accepting registration for September 2019 for students in Kindergarten and Grade 1. 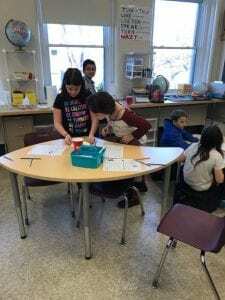 Spanish bilingual programming provides students with the opportunity to learn the basic skills for speaking, reading, writing, listening and communicating in Spanish. Being in a bilingual program develops an appreciation for cultural diversity, and encases problem solving skills. 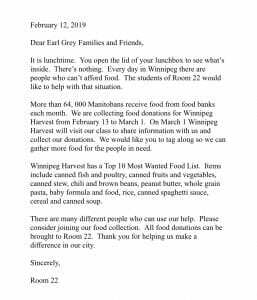 If you have any questions, please feel free to contact the school at 204-474-1441. We would be happy to meet you at our information evening. 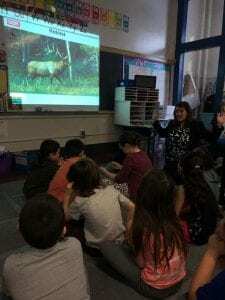 Room 23: What do you know about Manitoba animals? 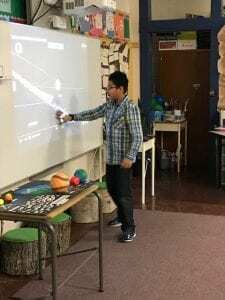 On Wednesday, February 6th we had a special visitor. Her name was Dr. Erin McCance from the University of Manitoba. With her, she brought different animal skulls, her animal trackers/collars, antlers, teeth and pictures that she took. The first thing she showed us was an elk skull and some of it’s teeth. We thought it was SO awesome and interesting. For some of us it was our first time touching a real skull. Did you know that a female elk is called a cow and a male is called a bull? 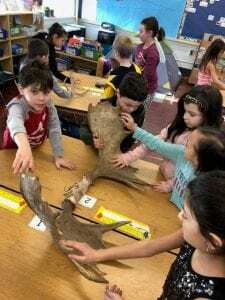 Next, Dr. McCance talked about the difference between horns and antlers. Horns never fall off. Antlers fall off every winter and the animal grows new ones in the spring. Did you know that a moose can weight up to 1500 pounds? We didn’t! Dr. McCance brought in a pair of real life male moose antlers for us to hold. They felt hard and very heavy. They must be VERY STRONG to hold up those antlers! Something that is very gross and interesting about moose is the way they attract the females with their bells. When the male moose want to find a mate they head to the muddiest area, walk in, go pee and they roll around in the mixture. The bell than starts to smell like the mixture and believe it or not the females love it. It is like perfume for moose! 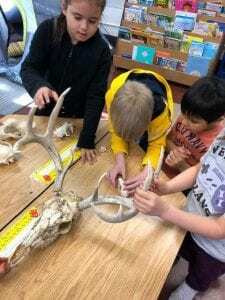 Dr. McCance explained to us that most of the male animal skulls she had with her had antlers but the white-tailed deer female also has antlers. Did you know that a female deer is called a doe and a male is called a buck? How many stomachs do you think white-tailed deer have? They have not 1, not 2, not 3 but 4 stomachs! When the white-tailed deer eats it’s food it goes down into it’s first stomach. When it lays down the deer regurgitates it’s food from the first stomach and rechews food ssssslllllllooooowwwwwwlllllllllyyyy. 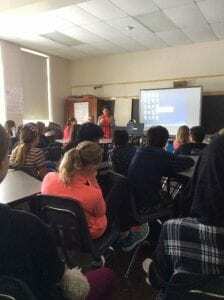 We learned so much information with Dr. McCance. One of the most important pieces of information that Dr. McCance shared with us was to “watch wildlife from far away because they might hurt you by mistake” like bite or attack you. She also said to leave the job of taking care of the babies to the mothers. Dr. McCance told us not to feed wild life because they can get confused and that it is important that they learn to find food for themselves. Some of the food that we might feed them is not good for their diet and can make them sick. We LOVED seeing the animal bones and having Dr. McCance come to visit us. We would love to see her again and learn some more! Our library needs more books! Today, we applied for the Indigo grant. A huge thank you to Mrs. Thompson and her student librarians for writing, producing and starring in this convincing video! Category: Uncategorized | 1 Comment on We Need Books! January brought many exciting adventures to Room 27. One of them was the 4,5,6 Share Fair. At the Share Fair students shared their interesting projects with their families, friends, teachers and fellow classmates. If they wanted they could be in a private room with just their parents. One cool project was Nolan’s Crested Gecko presentation. Another very interesting presentation was about Animal Cannibalism. There were so many different topics! The Grade 4 students all went to the Pan Am Pool for swimming lessons on Thursdays in January. We have learned how to be safe around water and ice. We have also learned the dos and don’ts when someone needs help in the water. We practiced using flotation devices. We have one more lesson left. As a class we have been studying Chemistry. What is Chemistry you ask? Chemistry is the study of properties of and changes in matter. You might also be wondering about the word matter and what it means. Everything is made of matter! You are made of matter. We have done several experiments to learn about variables and how we test one and control the rest. We are looking forward to more. 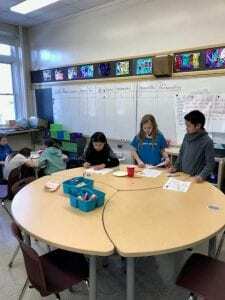 Share Fair details and ideas by the Grade 5 students. 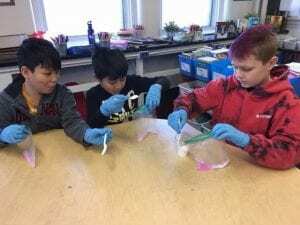 Chemistry by the Grade 6 students.